When I started cooking and writing regularly for this blog, I decided to let my whim take me where it would .. and of course, it lead me down the paths of cream, butter, and lots and lots of chocolate. But woman cannot live on that alone (well, she can try, but will end up as big as a house)… suddenly my cravings have changed. Gotten simpler, greener, more robust and earthy. I crave broccoli and butternut, spinach and beetroot. I am enjoying this change of focus (notwithstanding macaron class and the occasional batch of cookies) and I adore the food that I am cooking for its simple satisfaction, its beautiful taste, and its health(ier) context. Given all of that, this pasta is something that I have been wanting to try for ages. 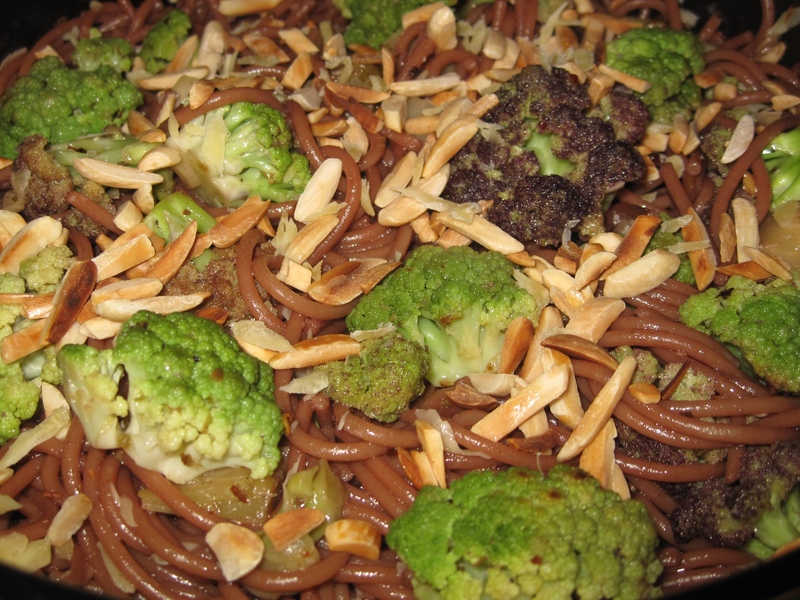 I found myself with a bottle of wine left over from the World Cup, and so … Braised broccoli, succulent and green, chili, garlic, and toasted almonds top plain pasta that has been finished in a bottle (yes, a whole bottle) of red wine. The pasta gets cooked in regular water first, and after five minutes, gets drained, and then finished off in wine. Because the pasta is already part of the way there, its pores are open, so to speak. It soaks up the wine, gaining a wonderful slightly bitter winey intensity, and glorious colour. Zinfadel is best for colour, but I only had a cabernet – didnt turn out half bad if I say so myself. This meal is a quick meal that feels like a celebration. Its so dramatic, the colours are so beautiful, and its soul satisfying. In a large, dry, non stick frying pan, over medium to low heat, toast the almonds until they are golden brown. Pour off into a bowl, and set aside for later. Peel the leaves off the broccoli, trim the stems, separate the head into small flowers, and chop the large stalks into medium sized chunks. Keep the stalk chunks and the separated flowers of broccoli separate. Rinse the broccoli under cold water. In the same large frying pan, heat olive oil (and butter if you are using), over medium high heat, until the oil starts to shimmer. Add the garlic and allow it to soften for a few minutes. Add the chili flakes and oregano, and the chopped stalks of broccoli, and allow to cook for 5 – 10 minutes until just tender crisp. Add the flower heads of broccoli to the pan, season with salt and pepper, and allow the heads to just sear in the hot oil. You will have a pretty full pan at this point. Add about half a cup of vegetable stock and let the broccoli braise in this liquid for at least 5 – 10 minutes. Test for doneness – add more braising liquid if needed. Once the broccoli is cooked to your liking (I like it still with a bit of bite in it rather than boiled to within an inch of its life), sprinkle over the lemon juice and set aside on the stove top. First of all, lightly oil the inside of a large pot with olive or canola oil. This will encourage the pasta not to stick to the inside of the pot as it cooks. Boil about 3 litres of water in the pan, and add salt. Add the pasta and cook for exactly 5 minutes. The pasta will have softened, but will not be al dente yet. Drain the pasta, reserving about 1 cup of the cooking water. Return the pot back to the heat, and pour in the bottle of wine and add sugar. Allow the wine to come to the boil, and reduce slightly, about 3 – 5 minutes. Add the pasta to the wine, and with tongs, turn the pasta in the boiling wine, allowing all of it to be covered by the wine. Check often, but after about 6 – 10 minutes the pasta should be a beautiful wine colour, and al dente. You might need to add the additional cup of cooking water in case the pasta is taking a little longer. Using your tongs, transfer the red wine pasta onto a serving platter. If there is any boiling liquid left in the pot, make sure to let it drip off the pasta as you transfer it. Add the parmesan (if you are using), half the toasted almonds and the olive oil, and toss the pasta. Add the broccoli, reserving a few pretty florets for presentation) and all its cooking liquid to the pasta, and toss, making sure that there is an even distribution of garlic and broccoli throughout. Taste and adjust salt and pepper as needed. Arrange a few florets on top, sprinkle with the remaining almonds, and serve immediately. Boy were we a greedy 6!!!! Most delicious thing you’ve created so far!!! Heh we were a greedy 5 😉 Thank you AngelKitten. I simply love the idea of finishing the pasta in wine. Brilliant! So simple, yes? But so delicious, and unexpected. Suddenly, the pasta has flavour and focus in the dish. Really yum.